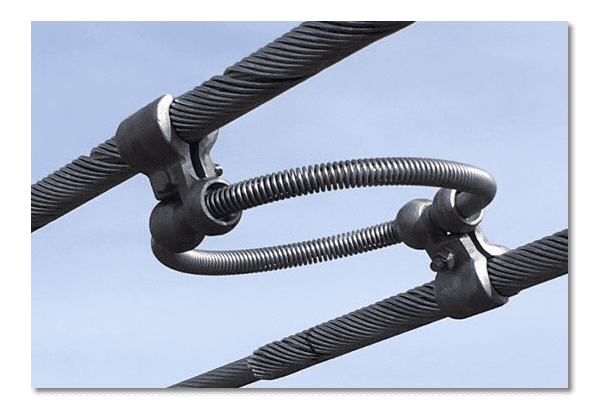 AR products have been protecting overhead transmission lines in the U.S. and Canada from high amplitude galloping for more than 50 years. A variety of models are available. Made in the USA, AR Products offers solutions intent on asset protection. A gallop control solution for twin, triple or quad bundles, the AR Spacer Damper is effective at controlling galloping and vibration of medium and long spans. 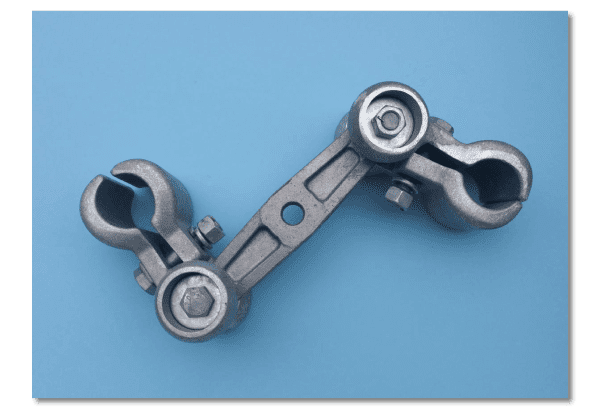 Acting as both a torsion and impact damper, the clamps are designed to swivel through large angles about the ring, a feature that allows the damper to attach to both vertical and horizontal bundles. This unique design mitigates sub-conductor oscillation as well as rolling of the bundle. Method of application interrupts single and double loop galloping amplitude. Articulating clamps rotate and twist the conductor through large angles to achieve effective galloping control of the twin bundled conductor, while maintaining separation of the bundle. Installed on the conductor at 60 degrees, the clamp is free to rotate about a hinge axis up to a 120 degree range of rotation. This design eliminates the potential for corona because the nut(s) at both ends of the stabilizer rod remain inside the bundle. Unlike rigid spacers that separate the bundle but without galloping control, the Lightweight has the widest possible angle of total rotation to facilitate a greater twisting ability of the conductor, and therefore greater galloping control.